Friday night the Spartan Track and Field varsity girls loaded the bus for a long trip to Hartland Arrowhead for the Myhrum Invitational. The girls competed against some of the top competition in the state and showed the strength of this 2012 program. 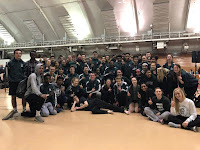 This was a great finale to the teams regular season schedule in preperation for the coming championship meets beginning next week. The girls were led by Corinne F's performance in the discus, her throw of 127' 3" was good for 1st place by eight feet. Hannah L added a 2nd place finish in the 400m dash with a season best time of 1:00.76. In the 100m dash McKenna G placed 5th with a time of 13.08 and teammate Marissa H. placed 7th with a time of 13.14. Marissa H added a 5th place finish of her own in the 200m dash with a time of 26.72. In the 4 x 800m relay Hannah L, Sara P, Danielle G, and Sara N joined forces to run a 10:25.3 for 6th place at the meet. The girls combined to score 32 points for a 10th place finish amongst strong competion.